I've been looking for a smaller size ironing board for my sewing room. I've been using one of those table top thingies, which I dislike very much. If you had this one, what would you use the three bins for? (The top raises to access the bins, and they are also removable.) Just trying to think this through. I'm also open to any suggestions. I just don't have much floor space available. I use a 2 x 4 plastic table and covered it with ironing padding that you buy, then made a colorful cover for the top. The table raises high enough that I don't have to bend over to use it. Never seen this type before but it looks like it could be handy. I am sure you would find something to use the bins for but at the moment I don't know what. You can make yourself one in any size you need. Purchase a 3/4" thick piece of plywood (most home improvement stores will cut the size you need. Paint a layer of sealant on the board (I use Gesso) then cover with a layer of Insul Bright and then a layer of Teflon Ironingboard cover fabric. I stapled the coverings directly to the wood. Not bad. you could put scraps in that project you are currently working on. Or clothing you're going to use for later projects. 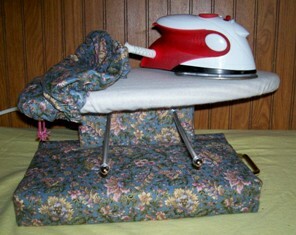 The only time I needed an ironing board next to my machine was for a crazy quilt. Since I tend to chain piece the ironing can wait and then I get the opportunity to get up an walk around. If I did want an ironing surface I would make it as above or go to a thrift store and get one of those old wooden folding TV tray tables and the use that surface for the ironing pad. I have one that hooks to the top of a door and folds down for use. Got it at a garage sale several years ago. I used a wooden tv tray with a beach towel on top of it and set it right next to me. I fold it up when I'm not using it. Since you want a small ironing board, the one you are considering should fit your needs well since the space underneath is not being wasted. The large bins can be used to store packages of batting, scraps, fusible/interfacings and similar large items you may have in your sewing room. Wow Sak658 that is really nice Like how it matches your chair! You don't need to worry about what you will put in the bins. You are a quilter. Give us storage and we will fill it. I have an old chest of drawers that originally had legs. I cut off the legs and that makes the top 36" high. The top with the addition of a cutting mat makes a great cutting surface. With an ironing mat it doubles as an ironing surface. It also provides me with three full drawers of storage space and two small drawers that hold cutting and marking tools etc. I attached wire mesh racks designed for storing wax paper etc. in a kitchen on the sides. They hold my wonder under etc. along with other stabilizers and there is even room for a small portable iron to hand off of the side. I hung a rack above it meant to hold lids etc. that holds my rulers etc. 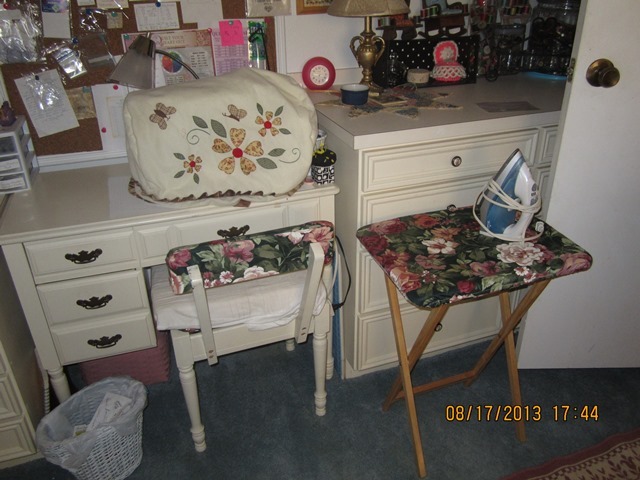 I was also thinking that this looks ideal for a small sewing area. I would store bags of batting in the 3 sections below as they have to lay somewhere! I'm in the process of making my own as well using a similar process to joyce888. I like your idea of using elastic so it is removable. I just got that tray for my Hubby to use for his laptop. Maybe I should have bought one for myself. I have an ironing board cover that I did not like the fit on large board that would make a good cover I think? I think I would use a wooden covered TV tray. While the link to Penneys looks interesting, when I need a small ironing board, I use a wood TV tray with a towel folded on top. It's sitting height, and I can put it right next to the sewing machine. When sewing somewhere other than home, I have a small portable ironing pad I can use with a small iron (or larger one if I feel like carrying it). Thanks to all of you for your wonderful responses/suggestions! I'm still thinking about this, but leaning toward the one in the link I provided since it would provide a little larger surface than the TV tray. I dunno ... I'll think about it tomorrow ... but not much longer. I'm too impetuous to wait long ... when I make a decision, I'm ready to get 'er done! This is one my DH designed and made for me. I have a wonderful iron to use with it. I don't use it for large projects but for pressing seams open it is great and takes up so little room. I bought a cutting board that is 16x20 from the thrift store, It is solid wood and I made a pressing board that I can use near my sewing area. I have one that is built into the wall but when I created my small sewing room it was a pain to go into the other room to iron. I went to Kmarts and for 20 bought one that hangs over the door and folds up if needed. If I have large pieces of fabric to iron I put towels on my kitchen island and do it there. that bin is nice but my room is soooo small, there would be no place for it. Missouri Quilt Company has a Video on a portable ironing surface that can be made any size from plywood, batting , and duck cloth for the surface. I have a table top ironing board that I keep on top of a stack of boxes of fabric and also have a TV tray for smaller projects close to the machine. Something to think about when making your own boards: I went to a workshop years ago with Sharon Schamber. 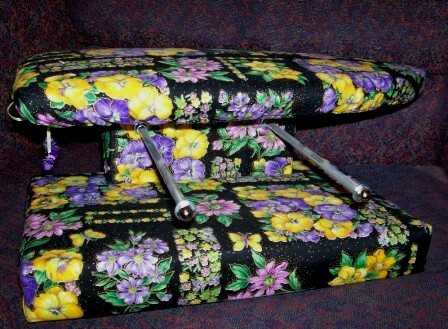 She sold small ironing boards that her husband had made. They were just wood with heavy natural-color canvas or duck cloth stapled to it. They have no padding, and therefore no "give" at all. The reason she leaves out the padding is she believes that too much "give" allows the block to become distorted when pressing. It took me a while to get used to the idea of such a hard ironing board, but now when I used the boards at my LQS which have multiple layers of ironing board covers on them, I can see exactly what she was talking about.